I have to say, The mind to muscle connection establishment is very important. The Mind to muscle connection or muscle mind connection is the process in which you become the muscle, you can feel the muscle being activated/working on, and it's a sign of doing good work, targeting the muscle efficiently to break it down effectively. People end up swinging weights and/or not targeting a particular muscle group right so having the mind to muscle connection will help with that. When people are wanting results, you have to know what you are doing to the body. Working out is good enough but if you have that mind to muscle connection, your muscle building process will become much easier for you. I find that once you have the connection, you can break down the muscle much greater resulting in more growth. 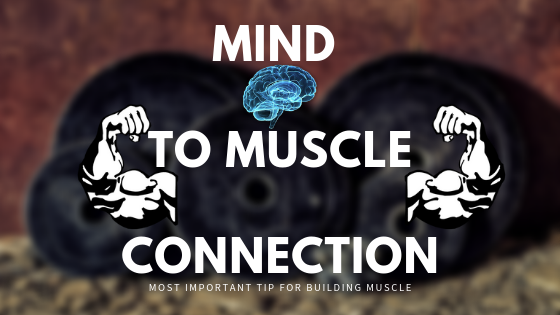 That is one of the main things I take into account when I'm working out, every time, is the mind to muscle connection. Sometimes I'll drop the establishment to keep driving the weights (essentially to boost my mental capacity) but having the strict form along with the connection is the key. ➤ Previous Article: [One] Recovery Method You Should Know! Underdeveloped muscles that are hard to target can be trained effectively by having that mind to muscle connection. For example, rear delts (shoulder) are usually neglected, if you think about the 'rear delt' you can activate it. People tend to overtrain certain muscles such as the front delt overpowering the shoulder and sometimes limiting the activation for other particular muscles/or it stops the other muscle from being worked on, usually being neglected which leads to injuries.. Posing. Try posing, I believe it will help because when you are posing, you are activating that muscle to flex, it requires the thinking in order to do that. Now, once you are posing, try to engage your thinking to the muscle you want to think about. For example, bicep flex, think about the bicep and flex it, you will become aware of it. Touching The Muscle. Touching, slight touches to the muscle can help with mind to muscle connection. Sometimes we people forget about what we are thinking about and thinking to lift the weights, that's all but touching the muscle that you're wanting to work can help you think and focus on that muscle only. Try it out. Angles, hand-placements, Tempo: These are ideal to every bodybuilder - if you fiddle around with angles, tempo and what not, you can achieve a much greater/lesser of a connection. Flex before workout and after. I find this beneficial to continually feel the muscle connection, flex the muscle before, during and after your workout.